Chicken Shack evolved from a Stourbridge based band called Sounds Of Blue who were performing in the West Midlands area by early 1964. The original members included singer and pianist Christine Perfect, bass guitarist Andy Sylvester, guitarist Stan Webb, and saxophonist Chris Wood. Talented guitarist Stan Webb is regarded by many as one of the great un-sung heroes of British blues music. He was born in London on February 3, 1946 and at a young age moved to Kidderminster with his parents. During the 1950’s, he started playing guitar in local skiffle bands and eventually formed his first group called The Blue Four. By this time, Webb was heavily influenced by American blues and R&B music and later formed Sounds Of Blue. Christine Perfect (born July 12, 1943) was from Bearwood, Birmingham and coming from a musical family, she learned to play piano at an early age and was also a talented singer. She later attended Moseley College of Art where she played in a group called The Bobcats which later became The Rockin’ Berries. often appearing at the Golden Eagle pub on Hill Street (see The Spencer Davis Group). By 1964, she had joined Sounds Of Blue and remained with them until 1965 when they changed their name to Chicken Shack and headed over to Germany for an extended engagement at Hamburg’s famous Star Club where many British acts, including The Beatles, had got their start. Another early member of the band was saxophone player Chris Wood who was also from the West Midlands and lived in Cradley Heath. He attended Stourbridge Art College in 1963 and learned to play the flute before later graduating to saxophone. By March 1964, he was performing with Sounds Of Blue although he left the following year before they went over to Germany as Chicken Shack. Chris Wood then joined the Kansas City Seven (see Locomotive) and later became a founding member of Traffic. In 1967, Chicken Shack had returned from Germany and Christine Perfect re-joined the line-up with the group playing throughout the West Midlands and most often at the Seven Stars Blues Club in Stourbridge. There were various drummers during this period before Dave Bidwell from London joined the band. entitled Forty Blue Fingers Freshly Packed And Ready To Serve was released to critical acclaim in 1968. 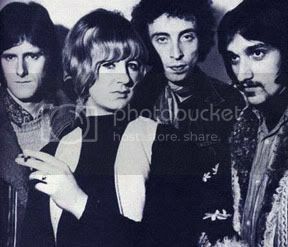 Chicken Shack also toured the U.K. in 1967 along with labelmates Fleetwood Mac whose bass guitarist John McVie struck up a friendship with Christine Perfect. The pair kept in touch after the tour and a long-distance relationship developed. In September 1968, Chicken Shack performed for the first of several times at the influential “Mothers” club in Birmingham. that the band had their first chart success. The record featured a lead vocal by Christine Perfect and won the group many admirers. By this time, Fleetwood Mac was enjoying much chart success. After they returned from an American tour, John McVie proposed to Christine and she accepted after deciding to leave Chicken Shack to become a housewife. Ironically she had just been voted best female vocalist for 1969 by the NME reader’s poll, but her “retirement” from music was not to last long. Paul Raymond from the group Plastic Penny was chosen as Christine Perfect’s replacement and another Chicken Shack single Tears In The Wind made the charts in September 1969. The next few Chicken Shack albums met with less interest and in 1970 Stan Webb had a falling-out with Mike Vernon which resulted in the group being dropped by their record label. There were also disagreements within the group which resulted in the departure of Dave Bidwell and Paul Raymond who both left to join the famous London blues outfit Savoy Brown. Undaunted, Stan Webb continued with a new line-up which included bass guitarist John Glassock from Jethro Tull and Paul Hancox on drums but by the mid 1970’s and after various other personnel changes, Chicken Shack finally disbanded. Since that time, the group’s 1960’s recorded legacy has attracted the interest of many British blues fans. Christine Perfect (now known as Christine McVie) went on to become a pivotal member of her husband’s group Fleetwood Mac in 1970 whom she joined after the departure of their brilliant guitarist and founding member Peter Green. That band achieved massive and worldwide success during the 1970’s, particularly in the U.S.A. where they continue to maintain a huge following. Stan Webb remains a much respected guitarist whose contribution to early British blues music continues to gain recognition. He still occasionally performs today as both a solo act and also sometimes with various new line-ups of Chicken Shack. saw them around 66-67 in a smallish back room of a Wolverhampton pub, lineup was around 4 people including Christine, pub was somewhere on the West edge of the towncentre – anyone know which pub this was , and the date? Saw them at Le Metro and possibly at Henry’s really got you going!